This fascinating book comprises in-depth interviews with 22 of Northern Ireland's poets: Seamus Heaney, James Simmons, Paul Muldoon, Seamus Deane, Michael Longley, Derek Mahon, Tom Paulin, Frank Ormsby, Medbh McGuckian, Ciaran Carson, Robert Greacen, Cathal O Searcaigh, Conor O'Callaghan, Gerald Dawe, Colette Bryce, Moyra Donaldson, John Montague, Jean Bleakney, Roy McFadden, Martin Mooney, Padraic Fiacc, Cherry Smyth. The poets featured were all born after 1920; each poet has published at least one volume of poems. Arranged chronologically by each poet's date of birth (to cover poems written in subsequent, if not always consecutive decades) this collection deals with a body of poetry that has increasingly attracted critical attention. The book aims to serve the reader interested in poetry as the student of Irish poetry in general and "northern" poetry in particular by encompassing as wide a range of poets as is possible within the confines of a single volume so as to include both established and less well known voices. Successive interviews explore the poet's work and development, the social/historical context and the impact of assimilated influences. If the interviews explore a poetry often rooted in "the North" they also suggest the individuality and diversity of this poetry, of work whose imaginative range is not circumscribed by either literal borders or critically convenient categories. In a period marked by both the "troubles" and accelerating change these poets' voices represent a sane and humane search for places where, as Derek Mahon put it, 'a thought might grow' and these interviews explore and honour the energy and life in a poetry that was often missing from the social sphere. 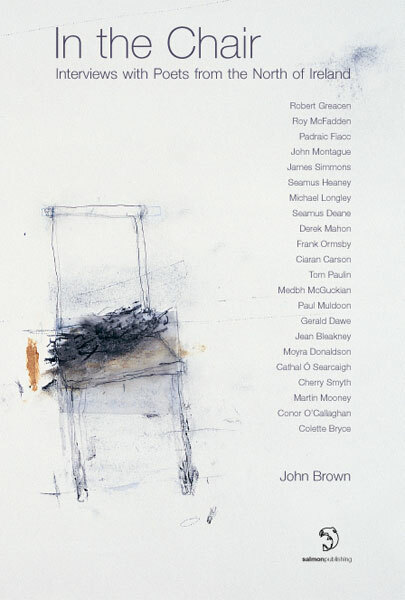 John Brown was born in Co. Derry in 1961. He studied English literature at Bristol University and Scottish literature at Edinburgh University, edited a poetry magazine (Gown Literary Supplement) in the 1980s in Belfast and has continued to write articles on poetry and visual art for journals and magazines both within and beyond Ireland. He was employed as Literature Officer with the Arts Council of Northern Ireland for several years. A. My father figures strongly in the first poems I wrote. I remember being uneasy when Death of a Naturalist came out, wondering how he would feel when he read things like 'Follower' and 'Ancestral Photograph'. There was an underground cable between us and whatever messages were exchanged were usually sent through it rather than through any talk we might have had. Whatever influence my father has had on the poetry comes from my tapping into the cable. Or from being one of the terminals. As far as he was concerned, I was in a different world and seemed to be operating in it competently enough, but we had no developed language for linking up on subjects outside the first world we'd shared. The question could equally be, how does the real get out of the unsaid? Sometimes it doesn't, it just stays in there, like a charge. My father's bound to have been aware of that too. There was a touch of the diviner about him, after all. He used to hold a silver pocket watch over the place where there was supposed to be a spring, and the watch would start to oscillate. Or maybe it was he who made it oscillate. Anyway, in those early poems I dug in to get at the source. There was something being broached between us, and I suppose I was anxious that the broaching might lead to a breach. It was serious, but then the seriousness made poetry something more than a word game. It was life-changing, life-helping even, and there was emotional risk involved. What I was making up was making a difference in the real. Which had to mean equally that the real was getting into the made up. But how it gets in, that's still a question you can't answer ahead of time. Q. Preoccupations (1980) records Anahorish, primary school in the 1940s, and it recounts encounters with three genres of poetry early on: bawdy, earthy rhymes; patriotic ballads or 'recitations'; school poetry learned by heart, like Keats's 'Odes' where 'midges' were 'gnats'. Do these three forms or tensions between them ghost subsequent poems? "In this hugely informative series of interviews, John Brown has delved into the biographical, social and literary influences of twenty-two Northern poets. Beginning with questions about early family life and the introduction to words, which Donegal poet Cathal O Searcaigh memorably describes as "Those winged birds that made the air around me whirr with excitement", the editor probes the extent to which the ongoing social and political unrest impinged on the poet's work. A major part of each interview concentrates on the different collections of poetry, with the editor's questions focusing on a particular viewpoint apparent from the poets' work. In this way he is able to draw out a range of influences which have coloured the poetry of each of the interviewees, making this an invaluable book for the student of poetry as well as for those with a more relaxed interest in Northern literature. The poets interviewed are arranged chronologically from their years of birth and range from Robert Greacen to Colette Bryce, encompassing the views of poets who have helped to express the evolution of Northern life over the past decades."